While all of our professional dentists have extensive experience within the industry, Dr Field himself is also a specialist in dental implants. This allows Green Apple Dental Clinic to provide you with the ideal solution to missing teeth, helping you achieve a more beautiful and confident smile. 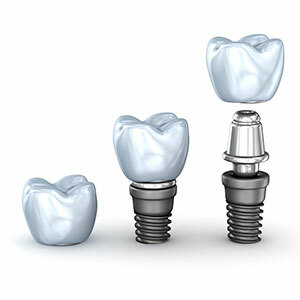 Dental implants act as a false (but very strong) tooth root that we surgically fit to the jaw bone. Once the site has sealed, we then attach a fixed crown, which will look and feel just like your natural tooth. While dental implants are the perfect solution to missing teeth, we are also able to use them for a number of other common dental issues, such as holding dentures securely in place or being used alongside crowns, bridges, or veneers to perfect a patient’s smile. Although dental implants are durable and extremely long-lasting, not every patient with a missing tooth is a candidate for this type of treatment. In some cases, patients might not have enough bone (or bone density) to warrant a dental implant. Thankfully, Dr Field is an expert in this procedure, so he will be able to use the latest dental technology to determine if you are able to receive a dental implant or not. Patients can also be assured that if a dental implant isn’t the answer for them, our dentist will suggest the best option for treatment. If you’re feeling unconfident about your smile due to missing teeth, or simply want to find out more about dental implants, please schedule a consultation with our expert team today!